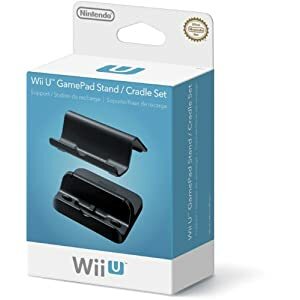 You didn't mention the Wii U GamePad Stand/Cradle Set that retails for $20 that is included with the Deluxe Set. I don't know if you would be interested that or not but it will be a nice place to put your GamePad while not in use. You're right. I forgot about those. I was going to make a new thread for this info, but out of fear of the master of locking I will just post this on here. If you have a Target in your area and still don't have a Wii U preordered, get to Target at 8 AM next Tuesday (the 30th). They will have preorder cards available for both the Basic and Deluxe Wii U sets, 5 cards for each. These will guarantee you one on launch day. That and they do have demo units set up now (at least at some Targets). I will admit the Gamepad was a little smaller than I expected. I really wanted White as well but I can't pass up on the Deluxe deal. I am going to sell my Wii to my cousin so I will need to rebuy a Wiimote, Nunchuk and Classic controller but at least I can buy them black now and have them match. It also comes with the vertical stand to put your Wii U in a vertical position. I don't think I will use it but I think that costs 10 bucks separate. I would have bought the charger stand for the Gamepad though because I like the one for the 3DS. So convenient just to place it down. Also most of the Nintendo Land games are actually single player. The more I see footage of it the more I want it. I got the Black Wiimote holder from Club Nintendo. All set to be black set. The Digital bonus (I will be buying all games Digital) and a bit more internal space doesn't sound too bad either. I obviously don't know you or your grandma so I could be way off the mark here but is there a possibility that your grandma won't allow you to pre order because she's secretly already ordered one for you as a suprise? Hopefully I am. Its pre-ordered at Best Buy as far as I know. I'm gonna get a Wii U, but whether it's Day 1 or not is up to how much money I have by November 30th, when it's released here in New Zealand. Besides, why do you have to buy day 1? it's like some stupid bragging right, why bother? it didn't really help when I got the DSi XL, 3DS and 3DS XL, so really why? Besides, even if I did manage to have enough cash, i'd still only be able to afford one or two games with the system. I really want the Premium Bundle because it has 32GB, it's black and it has Nintendo land, plus the 10% discount/rebate/whatever for the Wii U eShop. I can help not needing to buy a SD card or a HDD for my Wii U because I prefer to buy my games retail rather than digital and the games that I do buy digitally will always be VC, Ware or download software games. Believe me guys, day 1 purchases are ALWAYS overrated ok? there's no point in saying "im a launch day buyer, na na na na nah", nobody will care seriously.... I've been like that for the last 3 handheld launches and it really hasn't helped one bit. Anyways, all that aside the Wii U has a good solid launch range everywhere, especially here in Australasia (OZ & NZ) where us gamers usually complain about how developers are always ignoring our region for non-specific reasons. I'm particulary excited for New Super Mario Bros. U and Zombi U, they were some of the games I tried recently on Wii U demo units at the latest NZ Armageddon Expo (our version of comic-cons) and trust me they were pretty fun if you ask me. I don't care much about Nintendo Land, I'm not really into mini games and such, so even if I play it once, i'm not really missing out on anything if I never manage to playthough the entirety of the minigame compilation when it 's released. Pre ordered mine from HMV. Paid my deposit, so have a ZombiU pack ready for me on Nov 30th. Excited. Getting a system for bragging rights is, how do you say? wrong? I'm getting one, though not on launchday. I just want to play ZombiU and Chasing Aurora. @RetroGBHippie92 maybe it's because they're EXCITED ABOUT IT?! Just because you MIGHT not be able to get one on launch day doesn't mean everybody that is getting one is a stuck up prude. I have a deluxe preordered, but the shipping will take 3 days. I've got mine preordered. I'll be picking it up at midnight at my Best Buy. I just bought a Black Nunchuk. Since I am selling my Wii to my cousin I will need to rebuy the Nunchuk and Wiimote but at least I can buy them Black to match the Wii U. Also have the sync button on the back. certainly not me! i'll wait until christmas, and i'll get rid of my XBOX360 to pay for half of it. i only got it for HALO, but the fourth game isn't going to be worth it. Look dude, you don't know me obviously but don't insinuate that im a prude ok? We are all in the same team ok? I love Nintendo as much as you do, but you are assuming that everyone has a bucket of cash to throw where they like, I don't ok? I'm excited about the Wii U just as everyone else is but buying day 1 isn't necessary and maybe just foolish. Besides I already said, if I had the money by launch then I would buy day 1 but otherwise who cares ok? I'm not some rich spoilt kid/guy you know.